Note that all three areas can be very important for a great dive computer, but depending on your particular use case, you might not care deeply about some of it. where that third one obviously depends on whether your dive computer is air integrated or not. I would strongly argue that air integration is a primary issue, and having access to tank pressure data not only means that you have all your safety-critical information in one place, it adds very basic functionality that is useful whether you're a new diver or not: remaining gas time estimation. This basic information needs to be easily visible at all times: big clear fonts, no "press button to get at the information". Note that you generally also have additional special indicators for these primary groups: things like ascent rate markers and warnings, or notifications when you are approaching deco or gas events. all of which can be useful during the dive, but you may not actually need to use during any particular dive. The tertiary data is for things that aren't necessarily all that useful during the dive itself (although you might want to have it available - you may feel cold and wonder "what's the temperature"), but that you want primarily for logging. and some of these may only be available in surface mode and not during the dive at all. (Note that some of these you might need right as you come up - some dive boats want an immediate report of max depth and dive time, for example - and so they may need to be available while the dive computer is still in dive mode. Many dive computers have a timeout before they exit dive mode, and having the max depth visible only in the logs while in surface mode would thus be a design mistake). While almost everybody agrees on what needs to be displayed (although capabilities differ), the how you display something is where the differences between dive computers really show up. The most common low end dive computers use traditional seven-segment numeric displays with a few fixed special markers for state. They certainly work, and you can get used to them and even find them legible once you know exactly what number means what, but they tend to not be very informative, and it's often very hard to see at a glance more than one or two basic numbers. The inflexible display model also tends to mean that major mode changes - like going from recreational diving without a ceiling into deco means that the display looks almost exactly the same, it's just that there's a new mode indicator that has come on, and the meaning of the numbers have magically changed. In other words, it's just not a good dive computer interface. It's bad for beginners because it's so easy to get confused by mode changes, and the only real advantage of these dive computers is that they are cheap. Usually they are hard to set up too, partly because of the inflexible screen layour. If you've been diving that dive computer for 10+ years, by all means just continue because you know its quirks. I got started with one of these (the Suunto Gekko), and used a slightly improved version with a slightly more flexible pixel-addressable screen (the Suunto Vyper Air) for a long time, but I would simply not recommend a dive computer like that any more. Having ignored all those monochrome LCD screens, I'll just go straight to the only kind I would want to use any more: high-resolution colors screens with good contrast. The high resolution means that you can have well-formed numbers and state indicators, and the color is useful not only to indicate major state changes (eg green=good, red=bad) but can be very useful for grouping different information too and making it easier to read things at a glance. And the good contrast should be obvious, but sadly isn't always. A lot of screens wash out in bright light, or even have total internal reflection issues because the dive computer manufacturer couldn't get something as basic as "glance at it at an angle" right. Obviously size matters too, but is a trade-off. A really good bright screen with high contrast means that you can make it smaller, and smaller can be a real advantage when it's wrist-mounted in particular. You generally wouldn't want a super-small dive computer, but if you dive in warm water without a wetsuit (or with just a shorty wetsuit), big and clunky is definitely not a good thing. This is sadly an area where marketing and sales pushes people in one direction: a pretty display with graphically pleasing layout just looks "better" above water. The high-resolution screen almost screams for cool graphical effects like showing your profile in real time while diving, or making the cylinder pressure show up as a traditional gauge or as a cylinder that slowly empties. It makes for better marketing, in other words. But while you are admiring the dive computer when you buy it, when you actually dive it, you shouldn't be looking at the fancy graphics. If you can just glance at it and immediately get the basic information that you need ("Am I ok on air and deco? "), and then go on and swim down to get a better look at that shark that you just saw, the dive computer did its job. In other words, you do not want any extra distractions on that screen under water. and this shows a great layout of all the truly basic information you need during a dive. It also shows the use of color for grouping, and the high-resolution screen to use different font sizes to make the important numbers stand out more. Note how the screen also groups the data logically: the basic dive information (depth and dive time) together in the upper left, the deco information together in the upper right, and the gas information on the bottom. You have absolutely everything you need, and nothing superfluous. You can glance at that screen, and you're done. The buttons allow you to show the secondary information on the last line, if you want other information, it's there for you. But most of the time you never touch it, and you never ever need to look all that closely at "what is going on". A glance will do. These two are largely the same dive computer in different form factors. 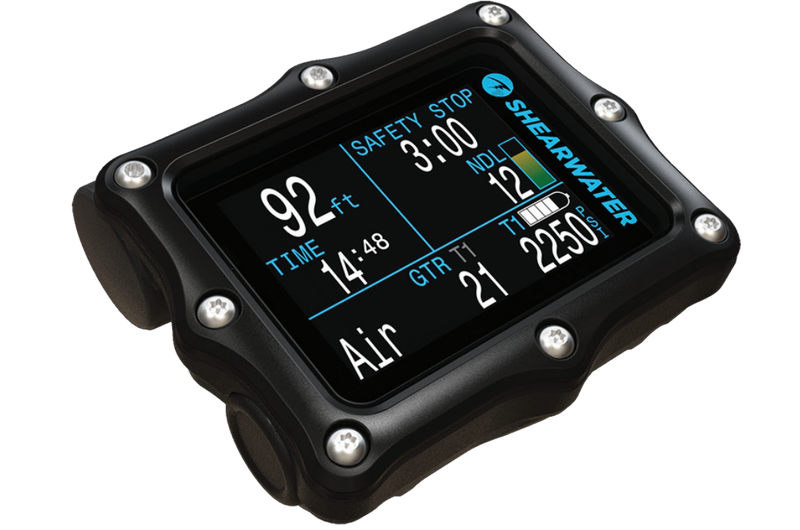 The Teric is the new wrist-watch form factor from Shearwater, while the Perdix AI is the bigger rectangular screen form factor pictured above. They do pretty much the same things, although you can definitely see how the Teric is more geared towards the recreational diver. Both have very good legible screens with high contrast, and show similar information, although the layout differs a bit (and the Teric has more configurability for simpler recreational layouts and for the use as a regular watch). The smaller face of the Teric might be an issue if your eyesight is very bad, but the OLED screen really does pop and is very legible. I personally prefer the Teric, partly because I tend to do mostly warm-water dives and small just works better for me. But partly because the Teric has four button navigation, and has a rechargeable battery (wireless). The Perdix AI has the best user-replaceable battery model in the industry - by far - but I still don't like opening my dive computer for battery changes, and while it takes any random AA battery, in order to avoid having to replace the batteries, you really should use the hard-to-find 3.6V Saft AA specialty batteries. The Perdix AI also has only two piezo-electric buttons, and while you get used to them, and eventually learn to navigate the menus using them, it's not a pleasant experience. It may be the best two-button interface in the industry, but that really is comparing to some horrible clunkers. The Teric's four buttons really do make it much easier to navigate the menus and enter information. But both dive computers are lovely. They are air integrated (that's what the "AI" in "Perdix AI" stands for, it's not some artificial intelligence thing), and you can connect two different wireless pressure sensors to both of them, in case you want to do sidemount diving or want to have pressure information from your deco bottle. The Perdix AI and Teric are also entirely wireless. The only way to download from them is over BLE, which works well, but can be somewhat slow. The Teric in particular is somewhat chatty and very slow over BLE, which isn't a big deal if you just download the dives from the last day, but can be somewhat annoying if you end up downloading everything after a trip. Like the Shearwaters, these are just two variations on the same theme, although even more so. Both are rectangular screen wrist computers, and the screen size is exactly the same. But the EON Steel has twice the battery in a very solid composite and steel body with a glass screen, and it shows in size and weight. It's a very solid piece of technology, to the point where I personally found it slightly inconvenient if you dive in warm water with little or no exposure suit. The EON Core is the same dive computer, in a much more lioghtweight form factor. At less than half the weight, it has all the same features, but also about half the battery, so you'll need to charge it more often. It still lasts for about ten hours of diving, so most dive trips it's "every second or third day" unless you are really going at it. The advantage of the EON Steel and Core is that they are very flexible dive computers: you can configure the screen layout to match what you want - including some fairly graphical versions if that is what you want. They are also very flexible wrt air integration, being able to connect to up to ten wireless transmitters, and actually logging them concurrently, which is both unusual (most dive computers log only the currently selected one, if they support multiple sensors at all) and really nice for sidemount. This is actually something of an odd duck: it's not a great dive computer, it violates all the rules for good displays: it is color, and it's fairly high resolution, but the contrast isn't great, and the layout is all kinds of wrong and non-intuitive. You really don't need to know how many seconds you have of NDL time, and no, heart-rate isn't the most important piece of information when diving. It also isn't air integrated, so you don't get any of that information either. So it's not a dive computer I'd recommend as a dive computer. But if you want to have a fitness watch, and you also happen to occasionally do diving, that's what it is. It's on the bigger side, so you migh want to be a bigger person than I am to actually wear it daily, but it will last a week as a fitness watch, and then when you go diving it just follows along. If diving is just a small part of the reason you buy the watch, it probably makes sense. Why do I even mention it? Because it has one feature I really like, and that single feature means that it's actually the third dive computer I dive with: it saves GPS location of your dive entry and exit points. And it turns out that I really really love that part. Not because GPS works under-water, or because I'd like to see the entry coordinates while diving. No, purely for dive logging reasons. Getting the GPS coordinates of your dive site is simply something I consider to be primary information for logging. Yes, before the Garmin, I would just take my phone with me on the boat, and have it run a GPS logger and then match it up with the dives by time. It gets you close enough for most purposes. But having GPS on the dive computer itself is simply better, and works particularly well for drift dives.